I am excited to have been offered a contract from a great publisher. Though the contract is not signed yet, I could not contain my excitement and had to share. I am very happy to be included in their wonderful business and am looking forward to our journeys together. Historical Romance, currently under contract with Black Opal Books. 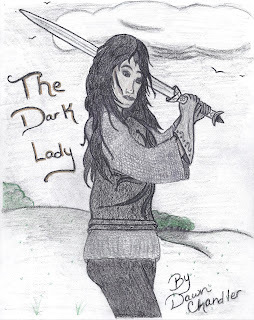 The Dark Lady was a joy for me to write. I fell in love with the characters immediately and knew I had to tell their story. The struggles that Van has to go through to become a whole person touched me deeply and I found myself cheering for her as I wrote. In essence, this book is about the struggles to break though the bonds of society and prove that one is more than the stereotypes portray them to be. I hope that my readers will fall in love with my characters as much as I have. Vanessa Fordella should have grown up in luxury and ease with a father that doted on her and loved her. Instead her mother stole her away and forced her into the life of a boy. Becoming Van instead of Vanessa was so easy for her she was sent to page training at Grayweist Castle. Large for a girl and uneven of temper it didn't take her long to make herself well-known. She rose through the ranks quickly and was sent into battle. She risks her life to save Peter Lawston and in return for her courage and honor King Henry II bestows her with knighthood making her The Dark Knight. For years she enjoyed being a dangerous and deadly knight until one day a message tore her beloved world apart. At her mother's dying request she agrees to marry. Peter Lawston goes home from the war with ideas of a simple and peaceful life. Peter has always had an ordered and controlled life and he wants to keep it that way. Pain and betrayal from when he was a child dictates the kind of man he is and the kind of wife he will allow himself to have. When his father grows ill Peter reluctantly agrees to marry a woman he has never met. As the carriage pulls up to the castle, Peter is hoping for a shy and controllable wife. What arrives instead is Van, a six foot tall Amazon of a woman with pent up rage and aggression who doesn't know the first thing about being docile or obedient. Peter and Van fight and struggle for power and control of the relationship. They fall in love quickly but her secret past is always a strain between them. Peter doesn't want to give up his idea of a perfect wife and struggles to turn her into what he wants. Van has always been the one in control and is used to getting things her way. She doesn't know how to let go of the knight that she has always been and struggles to become the woman and wife that she is expected to be. Both must give up their difficult past if they hope to have any kind of a future. Peter closed his eyes and his breathing became shallow. Numbness was beginning to overtake his mind. His thoughts were getting slower, he could feel it. He tried to concentrate on the boy’s voice above him, but his mind felt heavy and sluggish. The voice that had been gravely and deep at first had changed; softened, like a gentle breeze across his heart. He was confused at his thoughts. His mind was hazy. Delirium was obviously setting in. A groan slipped from beneath his numb lips. The sweet concerned voice caressed him, washing over him like a warm breeze. “Are you with me, can you focus on my face? Come on, talk to me. Open your eyes. I need to know you are going to be alright.” The gentle voice was like a melody to his war ravaged ears, a loving voice that brought forth images of that life his father had spoken of. Of children to hold and to love, not just some faceless heir to be his future, but a child to be his life. He opened his eyes to the young boy’s blurry face. The light from the fire pierced into him, cutting through him like a dagger. He shut his eyes again with a moan. “Come on focus, you are going to be alright.” There was fear in that soft voice that told him he was cared for. That he was needed. “Look me in the eye.” The worry that he heard enveloped him in warmth in a way no fire ever could. He could almost picture the mother of those children who would hold him at night when he was cold, as he was now. She would be beautiful, dark and exotic. When he opened his eyes once again the boy was gone and in his place was the beautiful yet blurry face of a girl. “Are you alright?” she asked sweetly as she leaned close to him. The face swirled in and out of focus and the boy was there once again. Peter closed his eyes tightly and shook his head. “I will. You first, I can wait.” The soft voice told him. When he opened his eyes once again she was smiling down at him. Her face was still slightly blurred, but he knew it was her from her melodious voice. Full lips parted in a sweet tinkling laugh, like water rippling over stones. “I will forgive you that since you have lost so much blood, your thoughts must be scrambled and your vision faulty.” A wide beautiful smile took the sting from the words. A deep trembling breath caused the world to shimmer before him and the image of the boy was once again before him. Peter pulled his hand away in confusion as he looked at the boy. “Quite. I have lost a great amount.” His arm dropped as darkness swallowed him. Look for interviews with the characters coming soon. OMG I want to read this!!!! Let me know when it comes out!!! Congratulations on your new publishing company and on your expertise at writing and editing your new book. I would imagine a lot of long and tedious but enjoyable hours have gone into it. Thank you all for your comments and support, it means a lot to me. I hope all my books are out on the market soon and yes there have been many long hours that went into my books, but I have relished every moment of them. Congratulations Rhonda Blazge-Johnson, You are my winner. Please watch your mail for the prize pack. Thank you all so much for playing along and helping me celebrate. I have also been offered a contract by B.O.B., which I'm anxiously awaiting. Congrats to us!